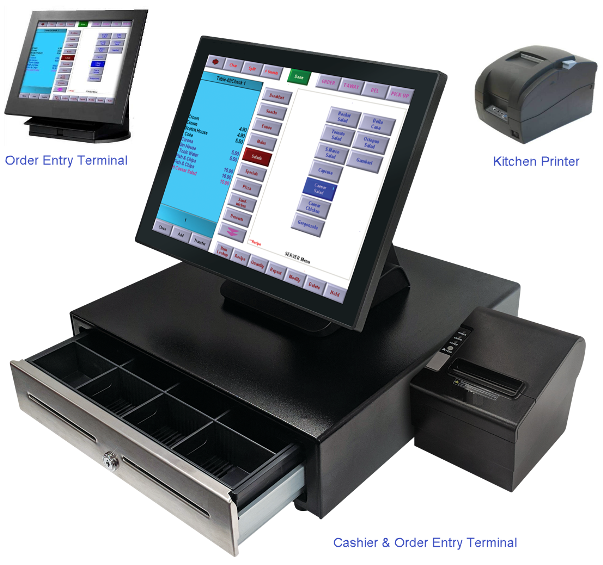 The Aloha POS touch screen solution is arguably the premier POS Hospitality Software product on the world market. Aloha is developed by Radiant Systems (part of NCR Corporation), listed on the New York Stock Exchange (NYSE), USA. Radiant Systems is a Microsoft ® certified solutions provider, winning numerous awards as a 'Retail Application Developer'. Back office Computer, Scanners, Scales, Kitchen / Order Printers, TYRO EFTPOS Terminals, other networked Aloha POS Terminals, Customer Pole Display, Magnetic "swipe" Card Reader, Finger Print Reader & Label Printer. Initial software installation and configuration is included in the price. This also includes programming your complete food & beverage menu (up to 400 items), employee list, receipt header and all other required system options. After your purchase, an Access POS representative will contact you to discuss the various programming options and request your detailed food & beverage menus prior to freighting the Restaurant POS System - Package J (Aloha POS - Two Terminals) package. The pricing below includes the first 12 months software support plus installation services and training. Training time is not limited as it is covered under software support. Software support agreements are offered after the initial 12 months at the prevailing rate but are not compulsory. 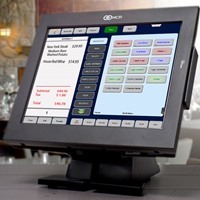 The NCR Aloha POS Software is supplied on a perpetual (everlasting) license basis which means you are free to use the software for as long as you wish with no on-going license fees. PROSPA PAY Buy over 13 weekly payments of $ 753.77 (ex. GST). No Interest ever and No Fees if you pay on time. Contact Prospa Pay online at PROSPA PAY or call 1300 706 983 for a simple over the phone application. No obligation. SILVER CHEF Rent-Try-Buy. Rent from $ 124.37 (ex. GST) per week for a minimum of 12 months before you decide to either Buy (with 75% of prepaid rental being deducted from the original cash price), Upgrade or Return at no further obligation. Apply online at SILVER CHEF or call 1800 337 153 for a simple over the phone application. No obligation. Synopsis: Get help and support for your NCR Aloha POS System or Aloha POS Software. We can offer free general Aloha POS Software advice as well as a free assessment of your Aloha POS System issue by either telephone or remote login via an internet connection. Please call us on 02 9817-7791 and ask for Geoff or email via our Contact Us page. 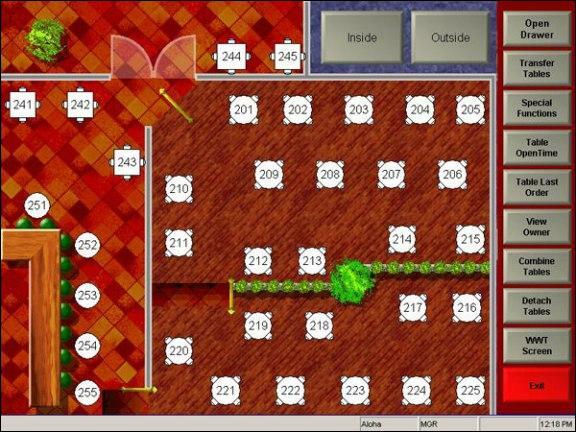 Synopsis: A brief video presentation of the world leading Restaurant POS Software - NCR Aloha POS. Access POS is the Australian distributor supplying resellers and direct to Cafes and Restaurants. Synopsis: Access POS has installed its flagship Restaurant POS System into "The Butchers Block" cafe restaurant in Wahroonga. Synopsis: Sandwich Express will open their new store in Kirwan (Townsville) with the Aloha POS "Quick Service" System. Synopsis: Over recent years we have seen a huge up-surge in the number of high-tech car wash establishments. Many of these offer full cafe / restaurant facilities for waiting customers. Access POS has recently installed the Aloha POS Quick Service system into Enviro Wash at North Rocks. Synopsis: It’s a playground with a difference. An adult’s playground; for relaxing and enjoying great food and drink, in a sophisticated, refined, yet “playful” atmosphere. Located in the heart of Canberra City, adjacent to the Canberra Centre and London Circuit, Playground Martini & Tapas Bar will open its doors with a Wireless Handheld Order Taking POS System with equal sophistication. Synopsis: Access POS has successfully installed the Aloha POS Quick service POS System into Thai Riffic Noodle Bar located in Westfield Bondi Junction (Eastern Suburbs of Sydney). Thai Riffic has some unique requirements that their previous Quorion POS System was not able meet hence the decision was made to install the Aloha POS Quick service POS System. Synopsis: Carmen's little taste of Italy is a well known Muswellbrook restaurant. Access POS is pleased to have been selected to supply the Aloha POS restaurant system to cater for their many unique requirments. Is this guy famous for all the wrong reasons? Synopsis: Have you heard of Ronald Gerald Wayne? 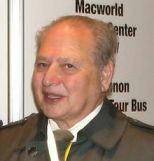 He was one of the three co-founders of Apple Computer (now Apple Inc) with Steve Wozniak and Steve Jobs. Find out why on this day (13 April) each year Ronald may feel somewhat depressed!